"And thus an airy point he won, where, gleaming with the setting sun, one burnished sheet of living gold, Loch Katrine lay beneath him rolled... "
The endless summer afternoons I spent at Loch Lomond and in the Trossachs, as they were known then, are truly some of the most memorable of my childhood. Playing in the streams, walking in the woods, and picnicking beside the river made for a perfect Scottish summer holiday. 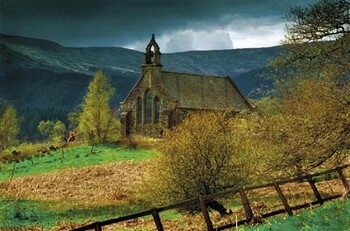 Now designated as one of Scotland's two National Parks, (the other being the Cairngorms) The Loch Lomond and Trossachs National Park has everything for the lover of the outdoors that you can imagine: walking, cycling, wildlife, fishing, lochs, streams, forests and rivers..and delightful little villages like Callander and Luss. 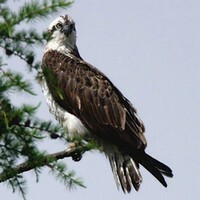 There are red deer, water voles and red squirrels, ospreys in the summer, porpoises and seals in Loch Long and Loch Goil, wading birds in the River Eachaig. 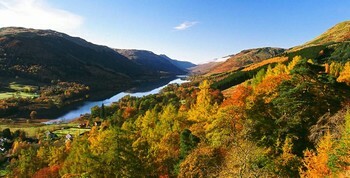 The park itself is cut through by the Highland Boundary Fault which divides the Highlands from the Lowlands. 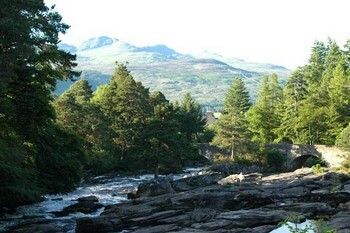 The Park is divided into four areas, Loch Lomond, Breadalbane, The Trossachs (between Callander and Aberfoyle) and the Argyll Forest. 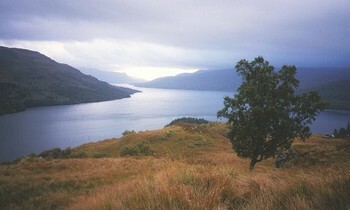 Loch Lomond is the centrepiece of the park, looked over by Ben Lomond. You can explore the area in several ways, including by bus (called The Trossachs Trundler) ferry or train, as well as by hiking and cycling. Loch Lomond is really the centrepiece of the park, and like the rest of the area very romantic and romanticised. There probably isn't a Scot anywhere who doesn't know the song about about the "bonny bonny banks of Loch Lomond". 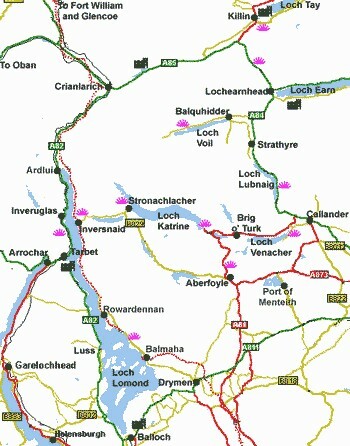 The loch is 24 miles long, varies from ¾ mile to 5 miles wide and has a maximum depth of about 630 feet. Its surface area measures 27¼ miles. It has the largest surface area of all the lochs, and is second biggest after Loch Ness in terms of water volume. 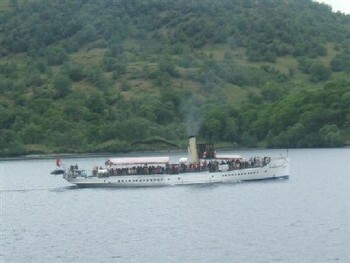 You can cruise the loch in the steamer SS Sir Walter Scott, which (or should I say who?) has been plying its trade for a hundred years. 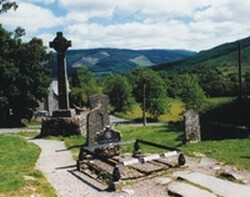 Sir Walter Scott himself wrote extensively about the area and its inhabitants, one of the most famous being Rob Roy who is buried at nearby Balqhuidder. 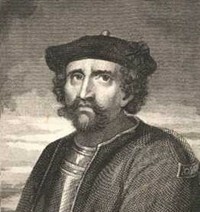 Rob Roy, or Red Robert (named for his red hair) was a herdsman and clan leader who took to raiding the richer lowland properties in order to feed his clan during the harsh winters. He was declared an outlaw by the Duke of Montrose, who subsequently burned down his house. Rob Roy retaliated by plundering the duke's lands more, and was imprisoned from where he repeatedly escaped. In the end he was pardoned, and his legend has merged over the centuries with that of the English Robin Hood. He is buried in the village of Balqhuidder, where his gravestone defiantly reads "Despite Them". There have been many movies made and books written about Rob Roy, besides those of Sir Walter Scott, and when you go to Stirling, you will find a statue to this brave and fascinating legend. 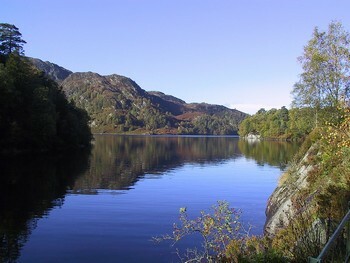 This is Loch Katrine, the setting for Sir Walter Scott's famous poem "the Lady of the Lake". 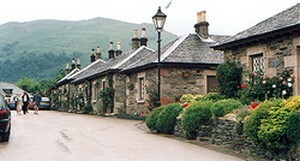 Aberfoyle is one of the little villages in the park and has the Trossachs Discovery Centre where you can learn about the history of the park. 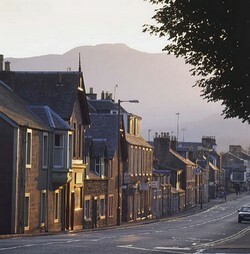 Callander is one of the prettiest villages in the region, and a quieter place generally, so relaxing and delightful for pottering about on a leisurely summer afternoon. I know if you get the chance to go to the Trossachs and the National Park, you will find yourself winding down, and becoming absorbed into the peace and beauty of the place. 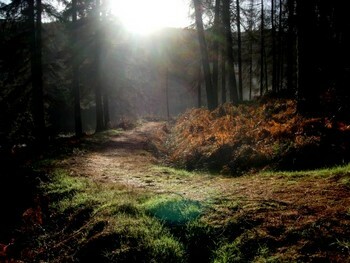 For anyone who loves the outdoors, this is a corner of Scotland you never leave behind..